Step one: Think food groups. Aim to have at least three of the four food group represented in your child’s lunch. Check out Canada’s Food Guide if you would like to review the food groups. Step two: Think outside the sandwich! Get creative when choosing items for your child’s lunch. Try changing something as simple as the type of grain. For example, using pita, flatbread, tortilla, or cereal instead of bread can make lunch more interesting for your little eater. Your child’s tastes may change from one day to the next. Try new foods regularly and don’t be afraid to try them more than once. You may have to offer new foods many times before your children learn to like them! Children experience food using taste, touch and sight. Keep them interested with lunches that include a variety of shapes, colours and textures. Cut sandwiches into triangles or diamonds. Use cookie cutters to make fun shapes. Change the bread – try different kinds of grains (rye, pumpernickel, flax) as well as the type of bread like whole grain tortillas, bagels and pitas. Offer various types of cheese (mozzarella, cheddar, Jack, Swiss) in different forms (cubes, strings, slices and balls). Kids love to dip. Use cottage cheese, hummus, yogurt, or guacamole as healthy dips. Keep these food safety tips in mind when packing your child’s school lunch and snacks. As with any meal, always wash your hands first. Prepare your child’s lunch on a clean surface using clean utensils. Wash all fruit and vegetables thoroughly (even if labeled “pre-washed”) before cutting them or placing them into your child’s lunch bag. 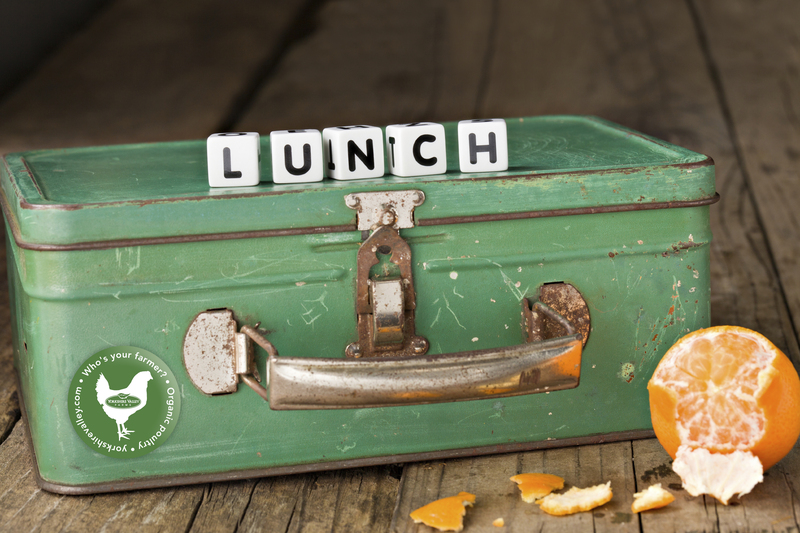 Do not reuse perishable foods (meat, fish, poultry and milk products) that come home uneaten from your child’s lunch. Keep lunches in the fridge until your child is leaving for school. Use an insulated lunch bag with a small ice pack for foods that need to stay cool. A frozen juice box or bottle of water can also help keep foods cold. Put foods that need to stay hot in a thermos. A thermos is also good for smoothies and milk. Be sure to keep reusable containers clean by washing well with warm soapy water. For more tips on packing healthy lunches, visit the EatRight Ontario website. Looking for menu inspiration? Download this sample weekly menu plan.